Here are some frequently asked questions related to TimeLine’s FlexPass. For further details, download our Subscriber Handbook. In what combination may I use my FlexPass admissions? What happens if I miss my scheduled performance? If I am unable to attend a production, what happens to my admissions? can I use my remaining admissions next season? Can I convert any unused admissions into a donation to the theatre? How can I find out how many admissions I have left? Why does my FlexPass subscription have an expiration date? How will I know when a show is opening? Can I reserve tickets online? What happens if the production is sold out? If the performance I want to attend is really sold out, can I sign up for a wait list? What if I am late to a show? You may reschedule for a future performance, subject to availability, or save your admission(s) and use them to bring a friend to another production during the season. We request a minimum of 24 hours notice if you find you are unable to use reserved tickets. Your admissions will remain valid through their expiration date (the day of the final performance of the season). You may give them to a family member or friend, or bring guests to remaining productions. If I don’t use all of my FlexPass admissions this season, can I use my remaining admissions next season? No. Your FlexPass admissions are valid only during the current season and expire on the day of the final performance of that season. Unused admissions cannot be transferred to the next season. No. Due to the structure of a FlexPass subscription, admissions have no redeemable cash value; therefore we cannot turn admissions into a donation for tax credit. If you are unable to use your admissions, we recommend inviting a friend or family member to use them. Call the Box Office at (773) 281-8463 x6 or email us at boxoffice@timelinetheatre.com and we will let you know how many admissions you have left. Your FlexPass is valid only during the current season and so expires on the closing date of the final production of the season. Our Performance Calendar is included in your Subscriber Handbook (download at right), and you can review the schedule online via our Calendar page. Also, you will receive a production flyer and Backstory prior to each show opening. If you have not made your reservations for the production by the reservation deadline, our Box Office staff will call to remind you. Yes! You may request reservations online by filling out and submitting this form on our website. You will receive an email confirmation from our Box Office within 48 hours. However, if the performance you wish to attend is the same day you wish to place your request, please call our Box Office at 773.281.8463 x6 instead. Many times when you hear that a production is sold out, we no longer have tickets for public sale, but we may have tickets available just for our subscribers. Due to space limitations, subscriber reservations are still subject to availability and may sell out as well. And remember, any seats held back for subscribers will be released for public sale 48 hours prior to each performance. We make every effort to remind you to make reservations before seating becomes limited. To ensure the best availability of dates, we strongly recommend making your reservations as early as possible. Starting one hour prior to a sold-out performance, our Box Office staff will begin a wait list. At curtain time, in the event of last-minute cancellations or no-shows, and at the discretion of management, seats may be released and given to those on the waiting list with priority given to current subscribers. We will not take wait list names over the phone; you must arrive in person to sign up. We cannot guarantee that seats will become available, but we will do our best to accommodate you. Due to our intimate setting, latecomers will not be seated. Please allow ample time for travel, dining and parking when attending your performance. If you are late, you will be asked to wait until intermission to be seated. Otherwise, you may reschedule your performance with the Box Office. We greatly appreciate your support as a subscriber! 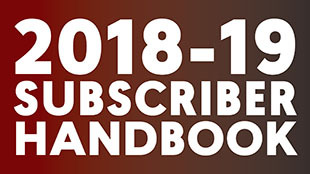 Download the current Subscriber Handbook for all the details about how your subscription works.